Christianity Today recently had a cover story reporting on Christians who claim that human beings could not all have descended from a single human couple. That story was a symptom of a current trend: more and more Christians, even self-identified evangelicals, claim that Christians must make their peace with evolutionary theory. In recent years, scientists such as Francis Collins, Karl Giberson, Ken Miller, Darrell Falk, and others have written books defending theistic evolution or evolutionary creationism. The historical reality of Adam and Eve is obviously central to historic Christianity; but it is just one of many issues that, as Christians, we must consider when exploring the broader debate over God and evolution. Unfortunately, the debate is often marred by confusion and ambiguity. Though we can’t discuss every related issue here, let’s see what we can do to think more clearly about the subject. CAN WE GET A DEFINITION? I am often asked questions such as, “Can you believe in God and evolution?” and “Isn’t evolution just God’s way of creating?” I always respond: “That depends. What do you mean by ‘God’ and what do you mean by ‘evolution’?” That might seem like a dodge, but everything hinges on the definitions. Presumably, a theistic evolutionist claims that both theism in some sense and evolution in some sense are true, that both God and evolution somehow work together in explaining the world. But of course, all the real interest is hidden behind the phrase “in some sense.” So we have to get more specific. A theist believes that a transcendent God created the world and continues to conserve and interact in and with it. God can act directly in nature or indirectly through so-called secondary causes, such as physical laws or the actions of human beings. At all times, however, God oversees and providentially superintends His entire creation, even as He allows His creatures the freedom appropriate to their station. Nothing happens as the result of a purposeless process. This is a minimal definition of theism. If someone believes a transcendent God created the world but denies that God can and does act within nature, then at best, he’s a deist. Change over time; history of nature; any sequence of events in nature. Changes in the frequencies of alleles in the gene pool of a population. The first meaning is uncontroversial-even trivial. The most convinced young earth creationist agrees that things change over time-that the universe has a history.2 Populations of animals wax and wane depending on changes in climate and the environment. At one time, certain flora and fauna prospered on the earth, but they later disappeared, leaving mere impressions in the rocks to mark their existence for future generations. There’s also cosmic “evolution,” the idea that the early universe started in a hot, dense state, and over billions of years, cooled off and spread out, formed stars, galaxies, planets, and so forth. This includes the idea of cosmic nucleosynthesis, which describes the production of heavy elements (everything heavier than helium) in the universe through a process of star birth, growth, and death. These events involve change over time, but they refer to the history of the inanimate physical universe rather than the history of life. Parts of this picture of cosmic evolution contradict young earth creationism, but the generic idea that one form of matter gives rise, under the influence of various natural laws and processes, to other forms of matter, does not contradict theism. Surely God could directly guide such a process in innumerable ways, could set up a series of secondary natural processes that could do the job, or could do some combination of both. In fact, to make a long story short, virtually no one denies the truth of “evolution” in senses 1, 2, or 3. And, pretty much everyone agrees that natural selection and mutations explain some things in biology (number 4). What about the fifth sense of evolution, universal common ancestry? This is the claim that all organisms on earth are descended from a single common ancestor that lived sometime in the distant past. Note that this is not the same as the mechanism of change. Universal common ancestry is compatible with all sorts of different mechanisms or sources for change, though the most popular mechanism is the broadly Darwinian one. Besides the six senses mentioned by Meyer and Keas, there is also the metaphorical sense of evolution, in which Darwinian theory is used as a template to explain things other than nature, like the rise and fall of civilizations or sports careers. Finally, there’s evolution in the sense of progress or growth. Natural evolution has often been understood in this way, so that cosmic history is interpreted as a purposeful movement toward greater perfection, complexity, mind, or spirit. A pre-Darwinian understanding of evolution was the idea of a slow unfolding of something that existed in nascent form from the beginning, like an acorn slowly becoming a great oak tree. If anything, this sense of evolution tends toward theism rather than away from it, since it suggests a purposive plan. That’s why Darwin didn’t even use the word in early editions of his Origin of Species. It’s also why many contemporary evolutionists (such as the late Stephen Jay Gould) go out of their way to deny that evolution is progressive, and argue instead that cosmic history is not going anywhere in particular. It should now be clear that theism is compatible with many senses of evolution. In fact, for most of the senses of evolution we’ve considered, there’s little hint of contradiction. Of course, this is a logical point. It doesn’t tell us what is true-only what could be true. The word “random” in the blind watchmaker thesis carries a lot of metaphysical baggage. In Neo-Darwinian theory, random doesn’t mean uncaused; it means that the changes aren’t directed-they don’t happen for any purpose. Moreover, they aren’t predictable, like gravity, and don’t occur for the benefit of individual organisms, species, or eco-systems, even if, under the guidance of natural selection, an occasional mutation might enhance a species’ odds of survival. The blind watchmaker thesis is more or less the same as Neo-Darwinism as its leading advocates understand it. It is usually wedded to some materialistic origin of life scenario, which isn’t about biological evolution per se. This so-called chemical evolution is often combined with biological evolution as two parts of a single narrative. These are representative quotes from the literature. From the time of Darwin to the present, Darwinists have always contrasted their idea with the claim that biological forms are designed or created. That’s the whole point of the theory. Theists claim that the world, including the biological world, exists for a purpose; that it is, in some sense, designed. The blind watchmaker thesis denies this. So anyone wanting to reconcile strict Darwinian evolution with theism has a Grade A dilemma on his hands. One way out is to redefine the theistic part. For instance, one could defend deism, with God getting things started at the beginning but not knowing or superintending nature after that. Dissolving a dilemma, however, is not the same as resolving it. If the adjective theistic in theistic evolution is not to be a misnomer, it should include a theistic view of God. What about redefining it in the other direction? A theistic evolutionist could maintain that God sets up and guides nature so that it gives rise to everything from stars to starfish through a slowly developing process. Organisms perhaps share a common ancestor but reach their goal as intended by God. God works in nature, perhaps through cosmic initial conditions, physical laws, secondary processes, discrete acts, or some combination, to bring about His intended results, rather than creating everything from scratch. Whatever the details, on this view, the process of change and adaptation wouldn’t be random or purposeless. It would implement a plan, and would reflect God’s purposes. This would be a teleological version of evolution, and so would flatly reject the Darwinian blind watchmaker thesis. This was the view of some early theistic evolutionists such as Alfred Russel Wallace, the co-discoverer of the concept of natural selection. Here the word evolution is being used in the pre-Darwinian, even anti-Darwinian sense. History is the unfolding of a purposeful plan. This is a logically possible view; it is not, however, the view of many of today’s theistic evolutionists, such as Francis Collins and Kenneth Miller. They seek to reconcile Christian theism with Darwinian evolution. They may affirm design in some broad sense at the cosmic level, but not in biology. How should we respond? There’s not much use in looking for evidence for this brand of theistic evolution, for the simple reason that it can’t be true. It’s not logically possible. It makes no sense to talk about a purposeful process that is nevertheless purposeless, or to talk about God directing an undirected process. To the degree that a view is Darwinian (as Darwinists understand it), it will not be theistic. And to the degree that it is theistic, it will not be Darwinian. If you understand that basic point, you’ll be much better equipped to navigate the current debate over theistic evolution. Jay W. Richards, Ph.D., is the author of Money, Greed, and God: Why Capitalism Is the Solution and Not the Problem (HarperOne, 2009). His article “Think Clearly about God and Evolution” appears in the Volume 35, No. 1 special origins issue of the CHRISTIAN RESEARCH JOURNAL. This special issue also includes a sneak peek at Hank Hanegraaff’s forthcoming The Creation Answer Book where he answers questions like: Did Adam and Eve really exist? Is animal suffering a consequence of Adam’s sin? Can the Big Bang be harmonized with Genesis? When was the universe created? This special origins issue available by donation only. In Darwinism, Design, and Public Education, ed. John Angus Campbell and Stephen C. Meyer (East Lansing, MI: Michigan State University Press, 2004). See the explanation for the meaning of “evolution” from the BioLogos Foundation, which seeks to give a Christian defense of evolution. The explanation begins with “change over time,” then goes on to fill out the definition with common descent and the Darwinian mechanism. But it quickly slips from defining the term to presenting the details as if they were uncontested facts. At: http://biologos.org/questions/what-is-evolution/. I’m not saying this is true. I’m merely dealing with the logic of the ideas here. Since design is logically compatible with universal common descent, one could, strictly speaking, endorse both intelligent design and theistic evolution. Nevertheless, these days, ID and theistic evolution often describe people with different positions. See discussion of this point in the comments of Thomas Cudworth, “Olive Branch from Karl Giberson,” Uncommon Descent (April 15, 2010), at: http://www.uncommondescent.com/intelligent-design/olive-branch-from-karl-giberson/#more-13010. For discussion, see Casey Luskin, “Smelling Blood in the Water: Why Theistic Evolution Won’t Appease the Atheists,” in God and Evolution, ed. Jay W. Richards (Seattle: Discovery Institute, 2010). G. G. Simpson, The Meaning of Evolution: A Study of the History of Life and of Its Significance for Man, rev. ed. (New Haven, CT: Yale University Press, 1967), 345. 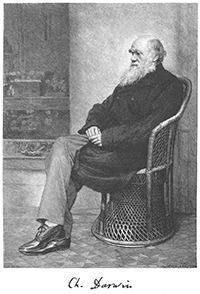 Francis Darwin, Life and Letters of Charles Darwin, vol. 1 (New York: Appleton, 1887), 280, 283-84, 278-79. Michael Ruse, Darwinism Defended: A Guide to the Evolution Controversy, with a foreword by Ernst Mayr (Reading, MA: Addison-Wesley, 1982), xi-xii. Quoted in ibid. For future issues of the CHRISTIAN RESEARCH JOURNAL, subscribe or renew your subscription or give a gift subscription. To view this article in the PDF format, please click here.